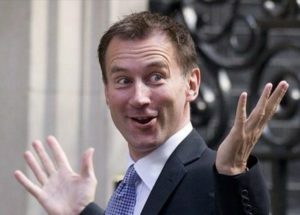 May’s panicked cabinet reshuffle on 9 July has finally rid our NHS of Jeremy Hunt who, after Boris Johnson’s resignation, has taken on the role of Secretary of State for Foreign and Commonwealth Affairs. His replacement is Matt Hancock who has moved from the Department of Digital, Culture, Media and Sport. The IEA has been funding Matt Hancock since 2010. 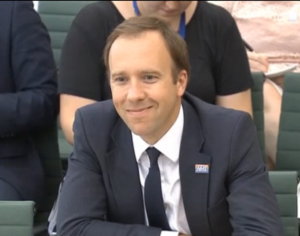 Speculation around why he has been chosen to replace Hunt can only result in an understanding that more privatisation and the introduction of more private technology companies are in the NHS’ future under his leadership. Though many may rejoice that Hunt has gone, the bitter truth is that the fight cannot relent until this Government is out of office. For a full write up on this please see our Press Officer, Samantha’s, piece on our website. For more information on the IEA and the worrying presence it now seems to have in May’s cabinet, Adam Ramsay and Peter Geoghegan have written this helpful article for Open Democracy. Hancock’s background in technology is likely one of the reasons for his appointment and the idea that he could lead a ‘digital revolution’ in the NHS. Our Press Officer, Samantha Wathen, has written a post for the KONP website entitled Apps and Our NHS – A Question of Priorities. Through the article Samantha questions whether Hancock is the best candidate to lead this digital revolution – given the privacy breach that resulted from the Matt Hancock App which was set up to allow local constituents to contact their MP directly. Confidentiality is obviously paramount when dealing with patients’ medical records and we have seen before the danger of the NHS being held to ransom through the massive Cyber security breach earlier this year. The app has the potential to be extremely profitable for its private provider, especially since it cherry-picks its patients with only those with straightforward or minor conditions permitted to register. It therefore sits well with the overall covert drive to erode public provision by this Conservative government. 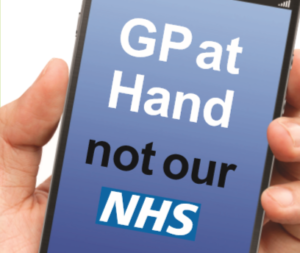 We have leaflets you can use to warn the public of the dangers of GP at Hand available from our online shop. Head here to read Samantha’s full article. Keep Our NHS Public is beginning a new series of videos called, What You Need to Know. They will present in bitesized chunks some of the key issues facing our NHS and hope to serve as an accessible introduction to what can be complex topics. 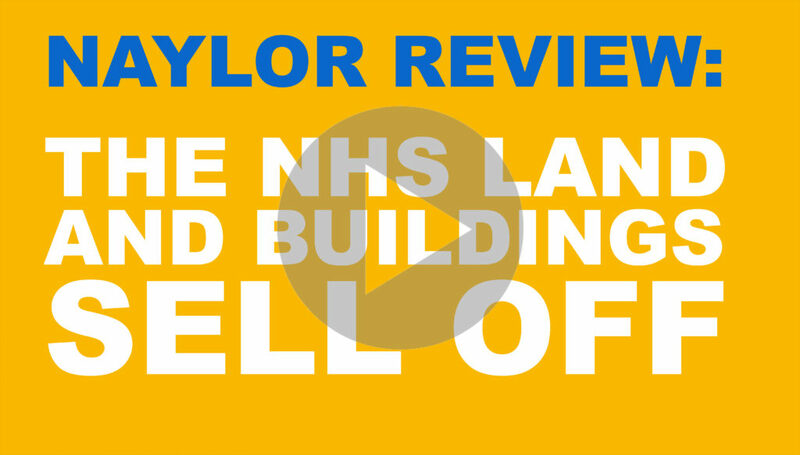 Our first video focuses on the Naylor Review (The government’s proposal to sell off up to £5.7billion-worth of NHS land and buildings). 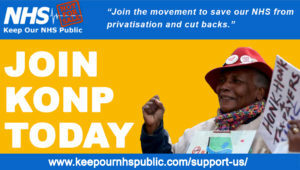 We’d love to hear your thoughts so please email activity@keepournhspublic.com with any feedback. 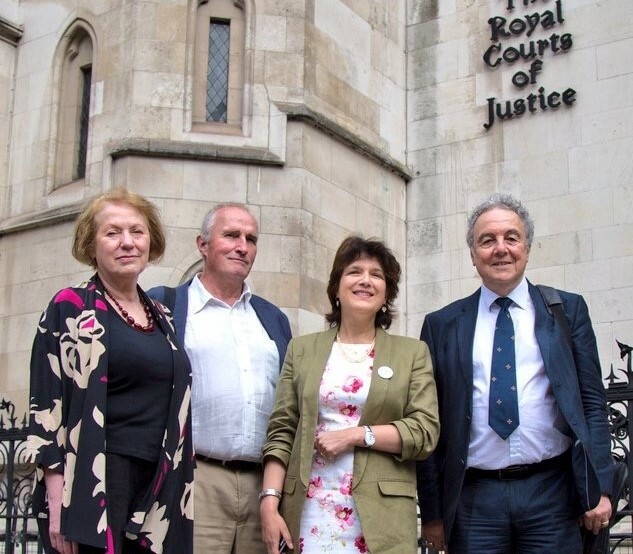 On 5th July, the High Court handed down its judgement on the judicial review brought by the JR4NHS claimants against the Secretary of State for Health & Social Care and NHS England on their introduction of Accountable Care Organisations (ACOs) and we reported on the dissapointing verdict in our July Newsletter. There has, however, been a further positive development around legal costs. On 2nd August, Mr Justice Green announced his decision on who should pay the costs of the case. His decision was a vindication for the four claimants, and the now deceased Professor Hawking, and is really good news. Usually, the loser has to pay the winner’s costs, but on this occasion [Mr Justice Green[ing] has ordered the government and NHS England to pay us our costs up to 18th January 2018 because ‘the Defendants changed their minds about full nationwide consultation and the use of the ACO model by early adopters’ and also because ‘in some measure there was a degree of confusion caused by the use by the Secretary of State of misleading language to describe the process of appointment of ACOs (designation) and as to the issue of delegation’. … we had ‘acted in the public interest in bringing the claim and have identified some serious and important issues which will need to be considered during the course of the consultation, the substance of which will have been improved by the airing and ventilation of the Claimant’s concerns and criticisms’. The judge also noted that we had ‘succeeded on certain subsidiary points of law arising under the outstanding substantive grounds’. 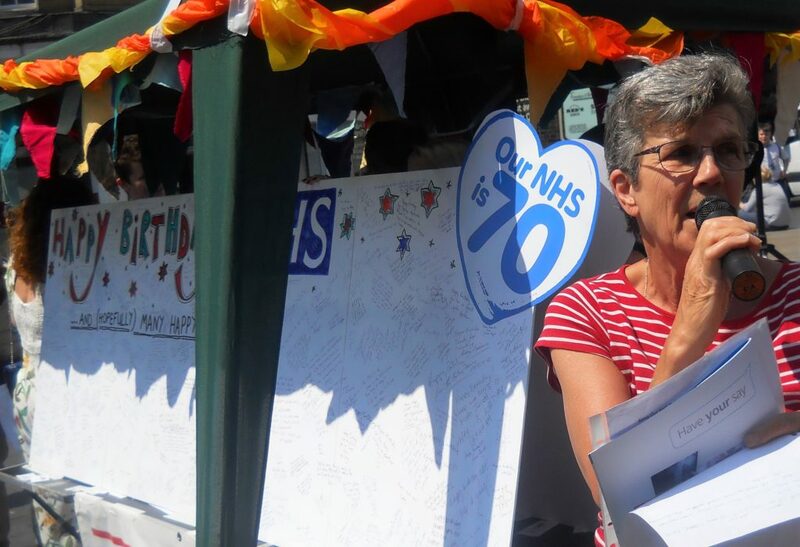 On 11 July KONP campaigners joined the team behind the Campaign for the NHS Reinstatement Bill and others outside parliament to support Eleanor Smith MP in her tabling of her 10-minutes rule bill, backed by Labour, to reinstate the NHS. 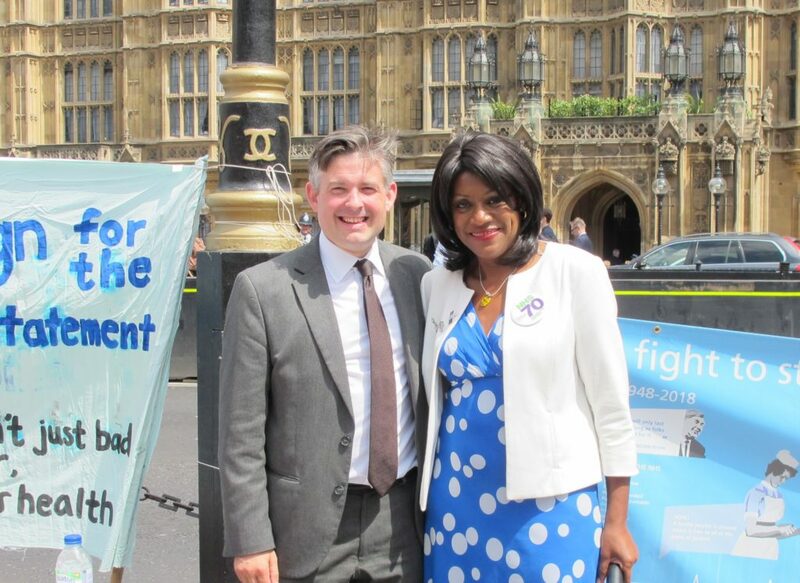 The shadow secretary of state for Health, Jon Ashworth and Eleanor herself joined the rally and spoke. A video from the day can be found on our YouTube channel and video listings page of the website. 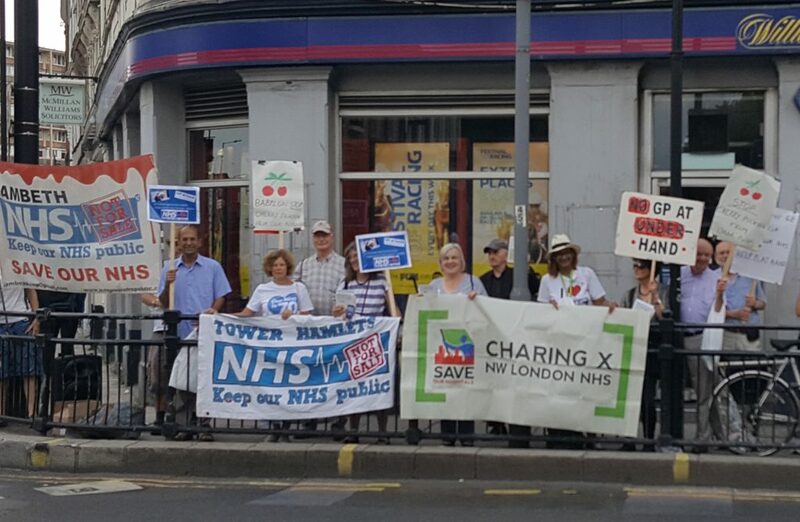 Save Our Hospitals – Charing Cross & Hammersmith (SOH) organised a successful protest outside the GP at hand offices on the 24th July. For more information on the protest and for details on how to conatact SOH please see this article. Defend NHS Dorset’s Judicial Review against Dorset CCG took place on the 17 and 18 July at the High Courts where members of local KONP groups from Lewisham, Lambeth, Islington, Camden, Greenwich, and Kent joined them on the day to show their support. 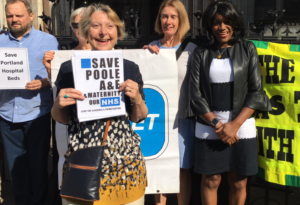 Defend NHS Dorset’s decision to bring the CCG to judicial review was based on the CCG’s decision to downgrade Poole A&E, close Poole Maternity Unit and to further close community hospitals and/or beds in 5 of 13 Dorset locations, as well as 245 acute hospital beds across the County. Through the Judicial Review (JR) it was bought to light that health bosses were not informed about risks arising from longer journeys to hospital before they agreed on moving A&E services from Poole. The CCG was forced to admit that 396 people per year would be at clinical risk due to longer journey times. BBC South Today covered the JR and spoke to campaigner and KONP member Debby Monkhouse outside the courts. 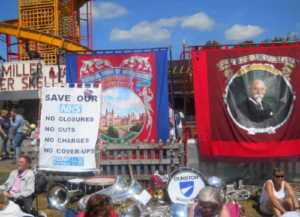 Members of KONP and HCT joined the 134th Durham Miners Gala on Saturday 14 July. Durham KONP had a stall giving out leaflets and information about our NHS to the thousands-strong crowd at the largest annual gathering of trade unionists in the UK. Opposition leader Jeremy Corbyn joined the speakers on the day and spoke, amongst other issues, of his committment to the NHS. Among KONP attendees were KONP North East who have shared some photos with us. Well done to the organisers and to Durham KONP for organising a stall and spreading the word about the creeping privatisation of our NHS. Along with campaigners around the country KONP North East put on a big celebration and demonstration in honour of our NHS’s 70th birthday. They, along with many others, took part in the NHS Birthday Card Campaign, encouraging people to write their own messages of thanks and support to the NHS in the city centre. A write up of there activities can be found in The Chronicle. They’ve also continued to hold meetings and displayed Marion Macalpine’s How Come We Didn’t Know exhibit. The KONP office received this press release from North Devon about their amazing campaigning work for the NHS’ 70th birthday. 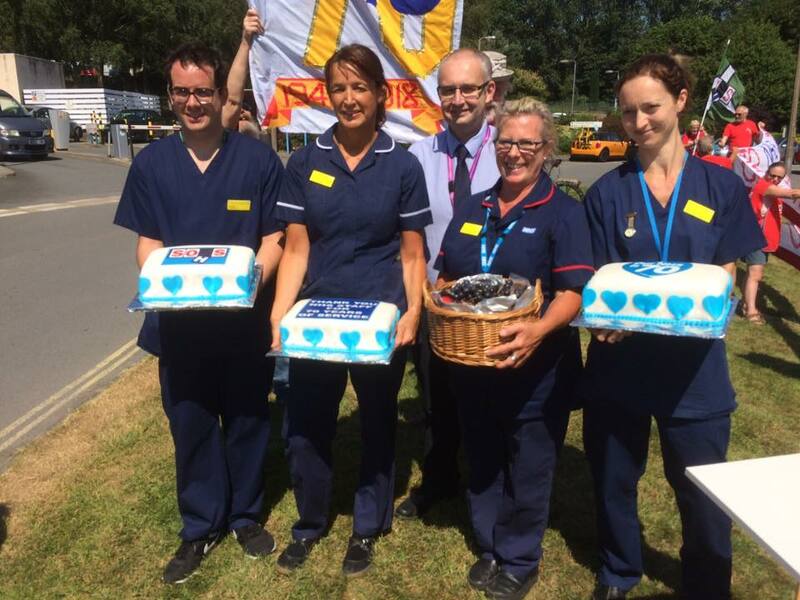 They held their first 70th Birthday event at Petroc College on June 22nd with an NHS Question Time and on Thursday 5th July, the NHS’s 70th Birthday, North Devon played its part in thanking this amazing institution for all it has done. SOHS took two enormous banners up to the hospital together with three appropriately decorated cakes showing messages of thanks to staff. On Saturday 7th July, North Devon held a public rally to celebrate the NHS 70th birthday. A positive public response was received when the SOHS campaigners marched with a samba band and 9 foot tall ‘Matron’ through Barnstaple. In speeches made at the rally the crowds heard about the 100,000 NHS vacancies across the country and how the government is relying on such vacancies to keep costs down. Campaigners formed the SOHS Devon campaign in 2016 and can claim wide public support with a fantastic 5000 residents attending their rally in Barnstaple on October 2016. The successful campaign for acute services to remain in North Devon is now focusing on accessible services at community hospitals and the quality of the substituted system of ‘Care Closer to Home’. A proposed integrated care system and NEW Devon’s failure to even respond to the Health and Adult Social Care Scrutiny Committee now provide a new focus for SOHS campaigners. SOHS have reported that Devon CCGs have recently invited the campaign to a joint meeting in recognition of the campaign’s role in calling for better funding. On the 1st August the High Court ruled that the CCG’s decision to replace Corby Urgent Care Centre with Same Day Access Hub would not be going ahead. They quashed the plans over failure to undertake public consultation, breach of public engagement duties, and providing misleading information to Governing Body members. The claimant, a local health campaigner, challenged the decision on the basis that it breached the legitimate expectation of local residents that there would be a full public consultation on changes to the CUCC and has been successful. This is fantastic news and hopefully shows Health Campaigners across the country that these battles can be won. The proposal in Leicester that would have seen members who currently provide services in-house being transferred to a separate company (subco), has now been dropped. This is a magical moment for us. We were called into a meeting on Monday and informed by the Chief Executive that the subsidiary will no longer be going ahead because they have not got permission as an NHS trust. Something that we have been telling them in negotiations. This is a fantastic victory for us and our members. However, had they listened to us in the first place it could have been sorted long ago. Congratulations to everyone who campaigned against SubCo and specifically to our KONP local groups in Leicestershire. 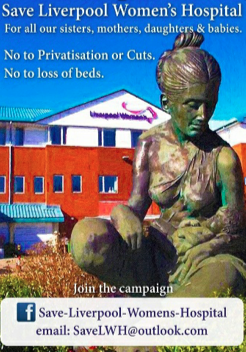 Please see this leaflet from Save Liverpool Women’s Hospital Campaign. You can also visit their website or Facebook Page for more information on the campaigning work they do. The organisers aim to bring together as many public services, organisations and unions to show their collective outrage against the destructiveness and inhumanity of this government’s policies and to show solidarity with those whose lives have been, and are being, and will be, destroyed. We are thrilled to welcome more patrons to our list of supporters. Owen Jones has now joined us as a patron and you can see a full list on the patrons page of our website. We’re honoured and thrilled to be working with them all. Will you join us, become a member, or donate? Thank you to everyone already supporting us. To everyone, we need your help more than ever. Please consider helping us in our campaigning by joining as an individual member and/or donating. There are many NHS-related appeals at present. But please remember KONP and consider a regular contribution however small – even £1 per month helps secure our ability to campaign. For instructions on how to join or donate please head here. ses clients toute l’ingénierie de services nécessaire,ainsi la mise en œuvre de ses métiers constitue pour eux un élément de plus-value de leur réussite ». et devantures vitrées, relèvent tous de notre compétence.